Anyone who used an early iPhone knows her voice. She tells you what the weather is going to be, where to find a good slice of pizza, whose birthday it is today, and the answer to nearly every absurd questions you can throw at her. 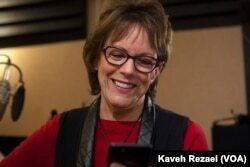 She is Siri, Apple’s voice-activated virtual “assistant.” But she is also Susan Bennett. Bennett is the original female voice of Siri, which debuted on the iPhone 4 in 2011. Getting into voiceover work, Bennett says, was kind of accidental. Before that, she was mostly singing. “I started singing jingles and doing studio work, singing backup vocals, and singing commercials and leads for, you know, radio and TV commercials,” Bennett says. Then one day, it happened. One of the voice actors didn’t show up at the recording studio to read the copy. Bennett got pulled in to substitute. From that moment, she was on a new career path. But still, Bennett did not expect to find her way onto your phone. Apple did not hire her, and Bennett did not audition for the role. In fact, she had no idea her voice would be used. In 2005, she was simply making recordings for a text-to-speech company. “For four hours every day, I would read nonsensical phrases and sentences that were created by programmers. The sentences were created solely to get every sound combination possible in the language,” Bennett says. After the recordings were done, the programmers went in and extracted vowels, consonants, syllables and diphthongs, as well as played with her pitch and speed. And that is how Siri was developed – based on recording sessions Bennett did. That is also how voices like Bennett’s find their way into digital devices like GPS and telephone systems. How did Bennett feel about being the voice of Siri? Bennett will tell you having certain skills are needed to be a voice actor. “You have to be able to read well and you have to be able to read within a certain amount of time. You also have to be able to read fast sometimes, because they like to put a lot more copy into 60 seconds than you would think,” Bennett says. Having a voice coach, Bennett says, is also key. For Susan Bennett, voiceover work came very naturally. She says it was an extension of singing – for her, she says, it’s about rhythm. “I think a lot of really, really successful and good voice actors can feel a rhythm to what they're reading,” Bennett says. Or, she says, they add or find a rhythm to make a character sound natural and authentic. Even though Apple stopped using Bennett’s voice in 2013, her unique rhythm and sound remains an iconic feature – not just of early iPhones, but of the broader quest to create meaningful conversation between human and machine.